Add an extra bit of surprise to your child's Easter basket with a personalized Hershey® Chocolate Holiday Basket Bar! Includes child's first name, greeting, year and graphics to make the holiday fun. Holiday bars are delivered to the purchaser to add to child's basket. Order early for Easter delivery. 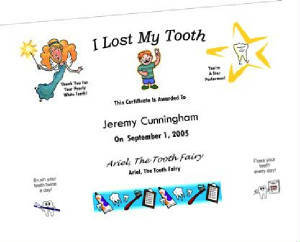 Add a personalized certitifcate, signed by The Tooth Fairy, and make your child feel great about losing their tooth! Includes child's full name, date, graphics and dental hygiene reminders to help encourage good habits. Click here for additional upgrades*.